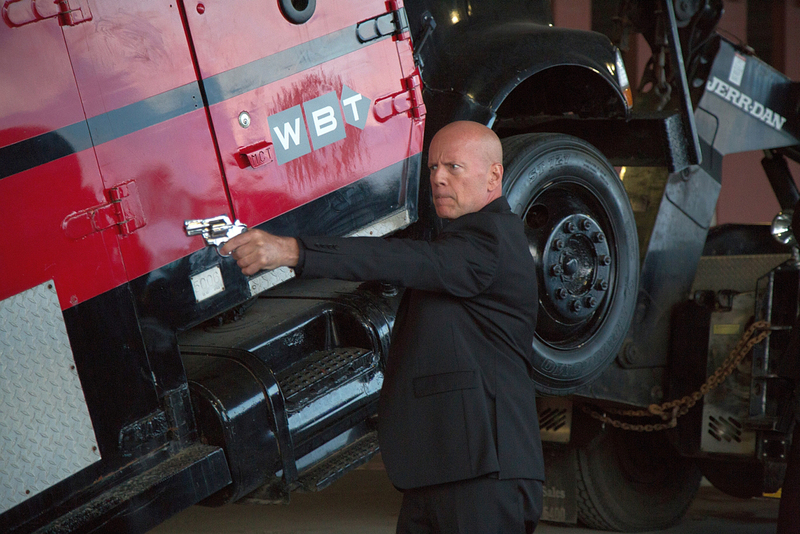 Bruce Willis plays merciless crime boss in the gritty action heist movie “Precious Cargo” also starring Claire Forlani and Mark-Paul Gosselaar. In “Precious Cargo” Eddie (Willis) hunts down the seductive thief Karen (Forlani) who failed him. In order to win back Eddie’s trust, Karen recruits her ex-lover and premier thief Jack (Gosselaar) to steal a cargo of rare precious gems. But when the job goes down, allegiances are betrayed and lines are crossed as Jack, Karen and Eddie face off in a fateful showdown. At the helm of the movie is writer-director Max Adams who keeps the audience guessing in his feature-length directorial debut. Since his arrival in Hollywood a few short years ago, the former Army officer and battalion commander, who also has a Master’s degree in film production, has risen swiftly through the ranks to become an in-demand action screenwriter known for his humorous, brisk dialogue, cleverly constructed plot twists and ability to write realistic action and fight sequences. But the story for “Precious Cargo” was written long before Adams arrived in Hollywood and while he was a graduate student at Florida State University’s film school. With his encyclopedic knowledge of cinema, action films and real-life action experiences after serving for six years in the Army, Adams quickly established himself as “the action director” after enrolling in Florida Stat University’s graduate school in 2006. A couple years later when it came time to make a short film for his Master’s Thesis, Adams wrote, directed and edited “Precious Cargo,” a story set in the world of multi-million dollar heists and double-crossing professional thieves. A short time later, while working on HBO’s acclaimed “Boardwalk Empire” the show’s writer-producer Terence Winter and writer-director-executive producer Timothy Van Patten encouraged Adams to write a feature-length version of the short, which he did. The cast and crew filmed “Precious Cargo” along the picturesque Mississippi Gulf Coast, inlets and waterways around the Gulfport-Biloxi area during an action-packed 17-day shoot—much of it in the sweltering early summer heat of May-June 2015. According to the cast and crew, with thunderstorms, oppressive humidity and temperatures soaring into the hundreds, Adams proved to be every bit the cool, calm focused leader that saw him elevated to a commanding officer in the 3rd Army Infantry in Iraq. “Precious Cargo” opens May 11 from OctoArts Films International.